Orga’s JBX020 light junction box series comprises compact units for use in Orga high intensity and medium intensity obstruction light systems. The boxes house power and data cable connections and have standard configurations with four entries at the bottom. Orga also offers the option of a fieldbus terminator. The junction box functions as an extension facility between the high intensity and medium intensity obstruction light system at one end and the control panel at the other. Orga’s JBX020 must be used with an Orga strobeline cable. Why do you need a junction box? 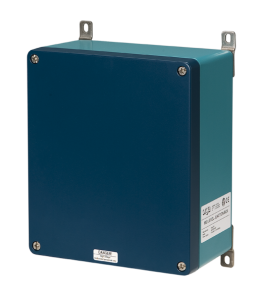 Junction boxes play an indispensable role in your onshore and offshore operations, both as a continuous source for data communication, and as a connecting source of power. Clearly, this calls for the continuous integrity of your junction box. Our junction box provides optimum connection facilities for an Orga Strobeline data cable, to ensure correct system operation and protection. At Orga we can assure you that the continuity of your power and data communication will be optimally covered. Why choose Orga’s junction box? As our light junction box demonstrates, our investments in new technology and product research reflect our commitment to continue producing quality systems to keep you ahead of your competitors and even ahead of your industry. Orga’s JBX020 light junction box is easy to install and has a rubber housing sheathed with aluminium, making it the strongest in the industry.